Dynamic welterweight prospect Mark Reyes Jr. will face veteran Javier Garcia in a six round special attraction bout Saturday, June 16 at The Coliseum in St. Petersburg, FL. Fighting out of Tampa, Reyes Jr. is 6-0 with 4 wins by knockout. The popular 22-year-old possesses explosive athleticism and dynamic punching power, most recently dispatching Larry Yanez inside of three rounds. A top amateur prior to his pro career, Reyes Jr’s camp believes the sky’s the limit. A 25 fight veteran, the Gurabo, Puerto Rico native faced a number of quality opponents. Garcia, 8-16-1 (5 KO’s), battled 11 unbeaten foes including title contenders Jose Gonzalez and Emmanuel de Jesus, Harold Calderon and Derrick Cuevas among others. Having fought all of his bouts in the Tampa Bay area, Reyes Jr. expects another strong showing June 16. Fire Fist Boxing has put together a solid card, headlined by an NBA Intercontinental middleweight showdown between unbeaten Ireland-based Tampa transplant Connor Coyle and rival Danny Pastrana of Orlando, FL. The co-feature is an important 8 round matchup between cruiserweights Nicholas Iannuzzi (19-4) and Vincent Miranda (17-2). Featherweight phenom Jose “Lil Pacquiao” Resendez, Ricky “Cowboy” Tomlinson, Ali Tareh, Joseph Fernandez, Rodriguez Cade and Kendrick Thomas are all scheduled to appear in separate bouts. “This card continues to get better and better,” said Jody Caliguire of Fire Fist Boxing Promotions. “We’ve got an awesome event scheduled for June 16 loaded with quality fighters. 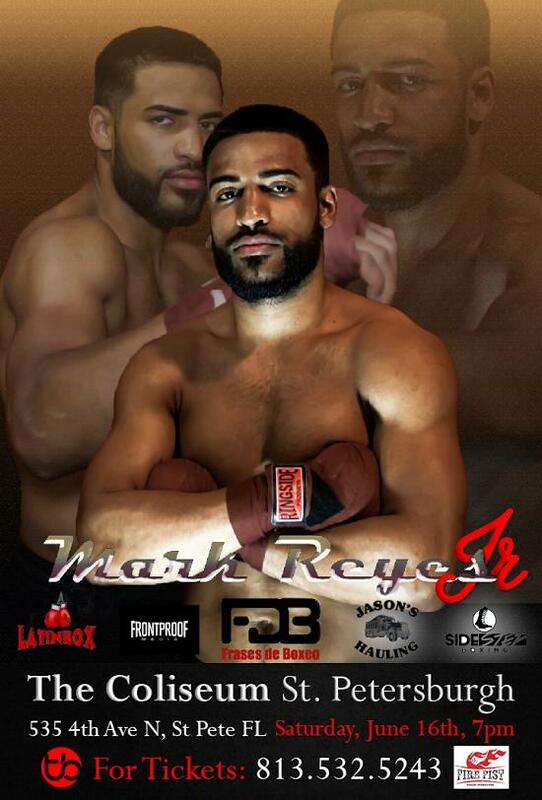 Mark Reyes Jr. is a talented fighter with a great fan base. I advise everybody to come out June 16 because you’ll get to see a number of quality fighters from difference backgrounds giving it their all”.